To this day exactly three years ago, I got to review a “Psychedelic Forest Folk” band from Finland called HEXVESSEL, a band with strong roots in paganism and mysticism. And as fate would have it, today I get to review their newest album “All Tree”. This album sees Andrew McIvor, co-songwriter from HEXVESSEL’s debut album “Dawnbearer”, joining Mat "Kvohst" McNerney once more. 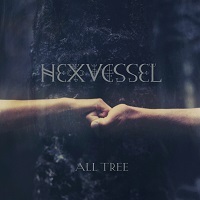 With a total playing time just over three-quarters of an hour, “All Tree” was formed using various influences of Celtic mythology and inspirations drawn from nature. These were combined in the writing of “All Tree”, weaving together a musical tapestry of spiritual revitalization of ageless tales, linking spiritualism, nature, and the universe. Starting off with the a-capella intro “Blessing”, the vocal harmonies are carried over to the very mellow song “Son Of The Sky”, with lulling melodies which wax and wane. A slightly disharmonic part gives the song a more unearthly vibe, whilst a guitar solo lends a more melancholic feel. “Old Tree” on the other hand has a haunting and ephemeral atmosphere, a simple yet sad tribute to one who has watched the ages pass. This is in stark contrast to “Changeling”, with a fluid metamorphizing melody that shimmers with intangible emotions, whilst the flutes give the song a soaring and transient feeling. Coming back to earth after this fleeting song is “Ancient Astronaut”, with stronger vocals, and a more solid and palpable melody. Next up we have a short interlude with the very surreal and bizarre “Visions Of A.O.S.”, which hint at why HEXVESSEL’s music can also be described by the word “psychedelic”. However, almost as if a dream has passed us and a new day dawns, “A Sylvan Sign” comes floating in on lithe wings, bringing up not just feelings of a new day, but of a very ancient and forgotten one too. “Wilderness Spirit” is perhaps the most different in style to the rest of the album, with a swinging Irish-inspired jig giving the album a playful air. But the direction changes again with “Otherworld Envoy” which is a slower melody with an ancient and yet somewhat sinister feel to it, its rolling disharmonics seeming to take you on an endless journey. “Birthmark” takes the pace down, allowing the very subtle psychedelic influences to come to the fore, although this can give the song a slightly drawn-out feel. “Journey to Carnac” on the other hand gives a quick and lithe interlude, before leading to the final two songs. Penultimately we have “Liminal Night”, a strange and disorienting song with an almost circus-like backing melody, interwoven with entrancing vocals. With this feeling almost of the ending of a ritual, we come to the final song “Closing Circles”. Here a very somber piano intro gives the song a dirge-like tempo, with a lamenting and hopeless sensation haunting the final notes. If there’s one thing you’ll likely take away from “All Tree”, it is the very deep-rooted natural spirituality of the songs. Whilst this certainly won’t be to everyone’s taste, if you’re looking for an emotional, folky, nostalgic, and calming album, then give “All Tree” a spin. However, this is as far divorced from what would typically be called “Folk Metal” as possible, so don’t let the sub-genre deceive you.